Growing up, I didn't eat much Mexican food. For the past 12 years I've been making up for lost time. This is probably more Mexican/American, but it's good nonetheless. I think of it as a "kitchen sink" soup. You really can add whatever you want. More pintos, no kidneys. More black, no pintos. More chilies, more tomatoes, no Rotel. Some add black olives, but I don't do olives of any kind. It all works. The basics are in the picture above. I also add a little less than one big bottle of low sodium V8 juice. I rinse my beans too. I don't know why Ranch Dressing mix is involved, but that's just the way it is. Restrain yourselves and do not add salt until everything is combined. 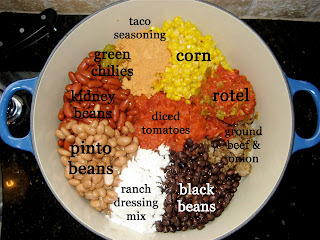 You'll be amazed how much salt is in the seasoning and residual liquid of the beans. Serve with cheese, sour cream, cilantro, or nothing at all. Freezes well. Hurry and make it before it gets too Springy out and no one is in the mood for soup. I want to not want soup. Don't you? Soup looks really good and easy. I will have to try it out sometime soon. I think I can handle throwing a bunch of stuff in a pot. I don't think it will look as good as yours does. I love you photoshopping. Pretty cool. So good and so easy. Forgot to mention that I've used ground turkey, even veggie crumbles as a meat substitute and no one could tell the difference. sweet! that looks quite tasty! how about chicken? i was going to make chicken pot pie for dinner but i could use the chicken for this instead? I'm going to make that. Looks yummy! Did I tell you that I made your hot wings? They were a hit! Tash, why not chicken! Let me know how it works! Glad the chicken wings went over well! Guess I should have done a "after" picture of the soup, all mixed up. Hmmm...Next time. Thanks for the comments! They make me happy! big fan of this soup, and with the help of Charisa's wonderful directions I was able to make it! you gotta rinse your beans! You just gotta!